I'm so excited to finally be able to share this quilt with you and the timing is perfect as the quilt has a Christmas theme. I quilted this for Raye back in March so we don't have this much snow yet. Raye actually made two appliqué quilts this year that I quilted for her and each are gifts for her two daughter in-laws for their birthdays which was this month. I'll share the second quilt in my next post. The quilt is called Celebrate the Season and was a series of 9 individual patterns by The City Stitcher - Designs by Janet Miller. Raye did all the appliqué by hand with a blanket/buttonhole stitch and still had a few embellishments to add on the snowman and gingerbread men after I was done quilting it. I had fun quilting swirls in the borders, different background fills in the blocks and did a bit of ruler work to make stars in the green squares. 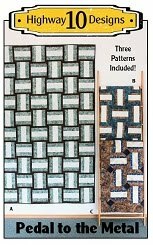 I though this would be a fun quilt to show the before and after pictures as the quilting really did change the whole feel of this quilt. very cute! nice custom quilting! That's right...it is not a quilt until its quilted! Your quilting looks awesome. 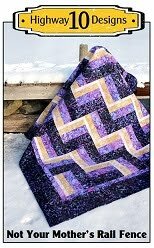 The straight lines with all the swirly quilting are a great combo. That's so amazing, the transformation! I just love the way a flimsy really comes to life after the quilting, and especially how (time and again) a good quilting job takes a flimsy I've felt quite "Blah" about and made me fall absolutely in love with it later. The quilt is adorable and your work is beautiful. 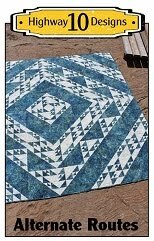 I just found your site and I love your quilting skills. Big difference with the before and after photos. 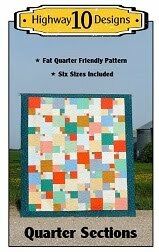 I always love your quilting and enjoy seeing the before and after shots. You're creativity is such an inspiration for me. Thanks for sharing. Kathy that is fabulous! 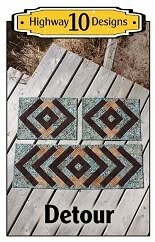 I love that kind of quilting-using different fills and designs in the borders-just take the quilt to the next level. And they are so much fun to quilt!! Love this quilt, you did a beautiful job quilting it. Beautiful job on the quilting, Kathy - as always! Can you tell me if Rae did this raw edge with the blanket stitch, or is it turned under? I have one "Yuletide Joy" (Susan Garmen) sitting here right now that I want to start working on, but don't think I can do it turned under. 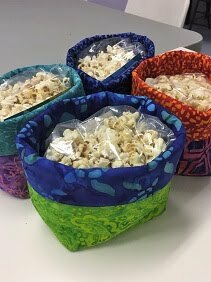 Thanks for sharing your fabulous work!